AZ GOP First Vice Chair advises Religious Right to vote for Al Melvin! 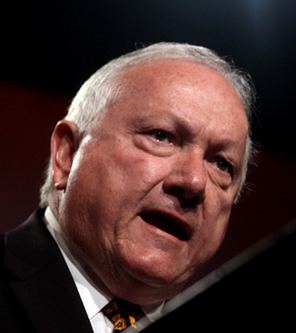 The dysfunctional Arizona GOP is once again allowing the disgraced and recalled former Senate President and current First Vice Chair of the Arizona Republican Party, Russell Pearce, to behave as if he is still “King Russell” (only in his own mind). If you call yourself a Christian, now is the time to stand and be counted in the name of God, country and family. I was very disappointed to see some of our Republican candidates for governor lose their nerve when it came to Senate Bill 1062, which amends the Religious Freedom Restoration Act. And now some state senators who voted for it want to hide and retract their vote for religious freedom. You would think that the Republican candidates for governor would be smart enough not to fall for that [“librul”] trick, but one after another some of them bailed, in advance, on their oath of office, that they will uphold and defend our Constitution. Our religious liberties are God-given and government has no business infringing on them. Arizonans are good, decent people who want to be left alone to raise their families and live the American dream, free from the yoke of too much government, too many regulations and too many taxes. I believe they want elected officials that protect “everyone’s” freedom, not just some. They oppose discrimination in any form and they believe in liberty. I encourage all Arizonans to follow his advice. It is time to elect warriors in defense of freedom. [“Onward Christian soldiers, marching as to war…”] It means electing a governor and others who possesses the courage and conviction to defend the inalienable rights that are enshrined and guaranteed in our Constitution. I love what the Republican Party stands for, and I’ll certainly support whoever our gubernatorial nominee is over Democrat Fred DuVal. But first there is a primary, and we have a moral obligation to call out those who fail fundamental tests like this. I won’t scold them each by name, but they failed us, as a group. The only candidate to date who has publicly supported SB 1062 is state Sen. Al Melvin. He says it is a good, common-sense bill that he would sign as governor. And the more the media stuck TV cameras in his face, the happier he was to defend our Constitution and our religious freedoms. See Challenged By Anderson Cooper To Provide One Example To Justify Anti-Gay Bill, Arizona Senator Comes Up Empty (Think Progress). So, I am going to help Al Melvin and I encourage every freedom-loving Arizonan to do the same. Visit his website to sign his petition and give Al a $5 contribution to help him qualify for campaign funding. One signature and $5 is a small way to stand tall with Al for our religious liberties. My friends, spread the word that our values are still under attack, and that those who are defending us need us to defend them in turn. “King Russell” has a very narrow definition of “Christian,” i.e., those who share his religious beliefs. I would venture to say that the majority of Arizona Christians, and people of other religious faiths or no faith, do not share Pearce’s narrow views. And that is what the First Amendment is all about: it cannot be violated by the likes of Russell Pearce to impose his religious views on people of other faiths, or no religious faith, through the sanction of law, or to interfere with the free exercise of their faith. SB 1062 is state-sanctioned discrimination that establishes one religious view over all others. Since “King Russell” has issued his royal edict that anyone who disagrees with his religious views has violated their oath of office and/or has failed the fundamental tests of freedom, does this mean “King Russell” is also advising the Religious Right to vote against state Reps. Ethan Orr, Kate Brophy-McGee and Heather Carter who voted against the bill? And Sens. Bob Worsley, Steve Pierce and Senate Majority Whip Adam Driggs who have since reversed their position and asked Governor Brewer to veto the bill? Does the edict of “King Russell” also apply to CD 2 GOP congressional candidate Martha McSally? Congressional delegation weighs in on Arizona’s controversial bill. Is “King Russell” also advising the Religious Right to oppose damn near the entire organized business community of the state of Arizona — the “GOP establishment” — which has come down four-square against SB 1062? Arizona’s professional sports teams? The Super Bowl Committee and the NFL? That’s a lot of hate from one man. Why is Arizona still afflicted by this hateful creature?